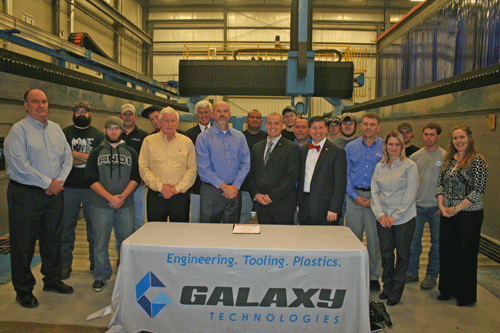 Currently employing 27 Cowley College graduates, Galaxy Technologies in Winfield, KS is one of the largest employers of Cowley’s vocational alumni in the area. The company is excited to continue its long standing relationship with the school by creating an expendable scholarship through the Cowley College Foundation to assist students entering Cowley College’s Machine Tool program. The scholarship will be available for students who are residents of Kansas or live in Kay County, Oklahoma and they must maintain a 3.0 grade point average. Since their founding in 1985 as Galaxy Tool the company has grown to employ more than 150 individuals. In 2011, after expansion into new markets, the company changed its name to Galaxy Technologies. Today, Galaxy Technologies aligns their work toward three strategic business centers of excellence – engineering, tooling and plastics tooling. The company serves as a major supplier for the design, manufacturing and assembly of production tooling for the aerospace, defense and plastic markets. Ben Schears, Cowley College vice president of institutional advancement, appreciates the willingness of Galaxy Technologies to work with the Cowley College Foundation on establishing this scholarship. Paul Maples, vice president of business development at Galaxy Technologies, serves on the Cowley College Foundation Board and is a member of the school’s advisory council for the Machine Tool program. As part of their signing ceremony, Maples took Cowley College representatives on a tour of the facilities 135,000 square foot manufacturing facility and captured a picture with Cowley alumni currently employed with Galaxy.